720 square acres of highly-decorative parklands seems too ambitious for even our family to explore in one day, but after the long drive to and from the Great Wall of China, I wanted the girls to run freely and explore. 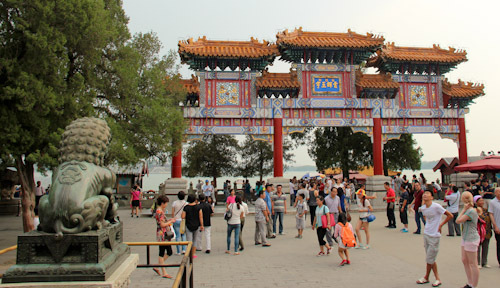 We visited the Summer Palace Imperial Gardens during the Chinese school holidays, so it felt very busy, but our tour-guide Linda showed us the major highlights and kept us rounded-up amidst the crowds. 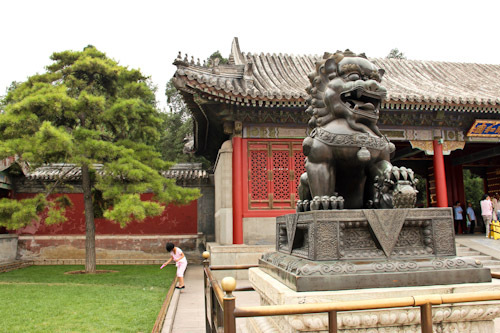 The gate to the imperial gardens is guarded by two lions. One has its paw on a ball, the other on a cub. Linda invited us to guess which one was male and which was female. In the centre of the gardens, Kumming Lake covers about 540 acres — and is entirely man-made. 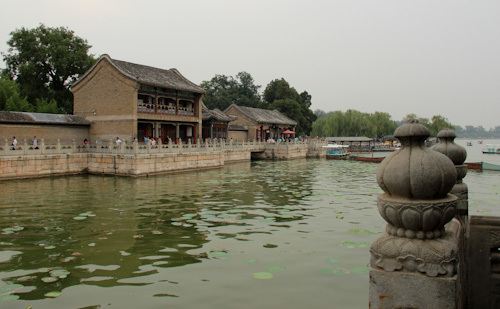 It served first as a reservoir for the town water in the twelfth century. 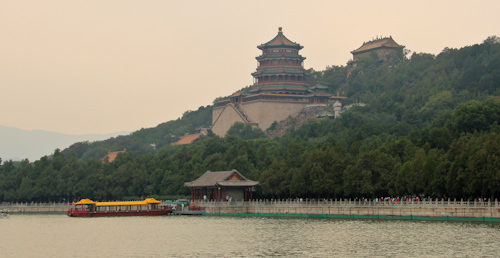 The dirt from its excavation became the adjacent Longevity Hill, upon which perches the Temple of Buddhist Virtue and other imperial buildings. Many of the buildings on site were once functional office or entertainment spaces. Now they're maintained as historical relics. The details in the paintings and carvings are amazing. 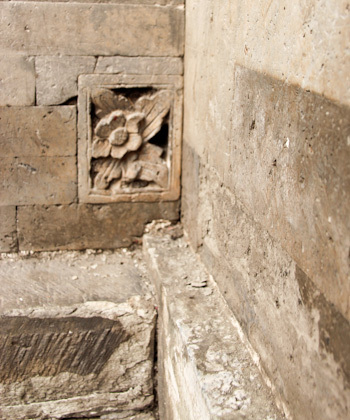 Much of the original carved stone is well-weathered by exposure to the elements, but I locate an intact flower still clinging to the internal corner of a wall. Each of the windows is a different shape at the Happiness is Longevity House. The lake is relatively shallow — mostly around 1.5 metres deep — and was dredged in the early 1990s, clearing it of several unexploded Japanese bombs from WWII. 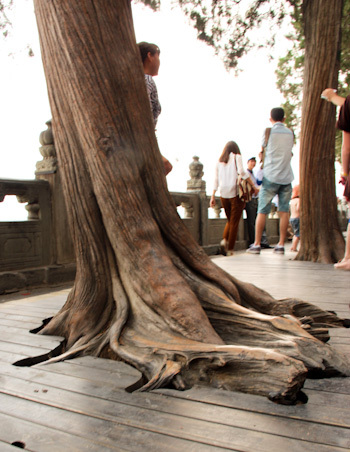 This tree's roots are rubbed smooth by countless generations. I love the juxtaposition of the parallel planks of the deck with the organic shape of the living wood. 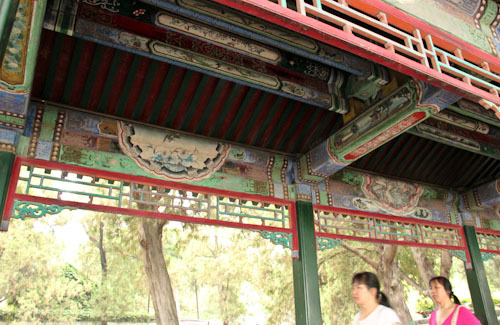 728-metres of paintings in the covered timber walkway called the Long Corridor alleviated the boredom of past imperial families. When we visit, there's a steady stream of Chinese tourists walking its length, taking pictures and remarking on the artworks. This amazing gate — the Yunhui Yuyu Archway — is also known as the Glowing Clouds and Holy Land Archway. I feel like I'm looking at a cliché when I see structures like this, but this is absolutely the genuine article from which all the knock-offs are inspired! 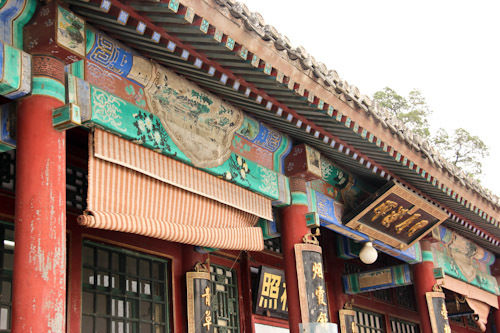 The red lanterns around the perimeter of this building that serves as a restaurant catch our attention. We're too early for the Autumn-moon festival (which coincided with my visit to Hong Kong in 2009), and from the girls' responses to this small display of festivity, I know they would enjoy being in a Chinese city during festival-time. A marble boat sits in the waters of Kumming Lake. 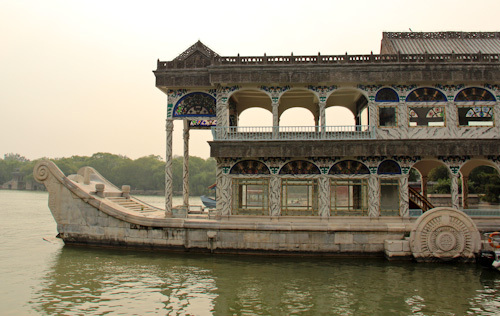 With marble representing the imperial family and water representing the masses, the boat's designer is quoted as saying, "the waters that float the boat can also swallow it" — a not-so-subtle warning to the emperor! 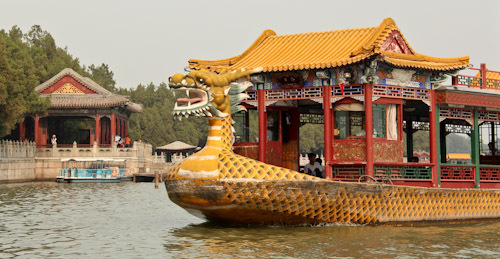 The dragon boats cross the lake purely as a pleasure ride, and we board one to return back to where we started. 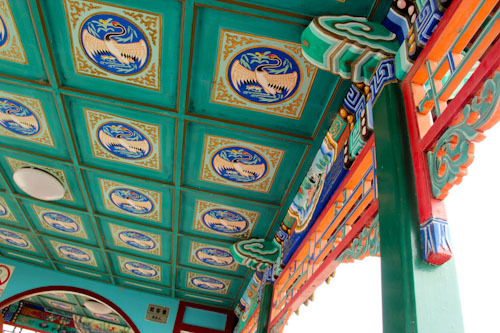 Even the boat's interior is intricately painted. A sign placed up high tells us how many passengers the boat can hold. Since we've been learning Chinese characters, the girls have been recognising words everywhere! 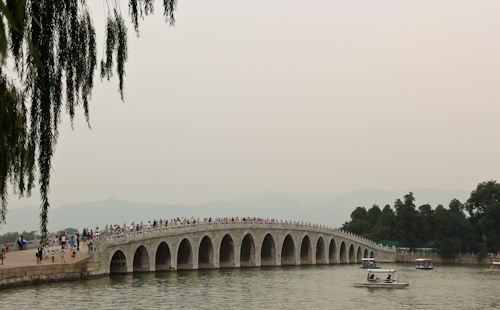 The Seventeen-Arch Bridge was built in the eighteenth century. The girls' Aunt Cheryl is waiting for us on the shore. She and I caught up late last night, but this is the first time Cheryl has seen the girls in four years! Our visit to China was originally booked so our girls could visit their Chinese cousins, but last-minute travel means they're currently out of the country. 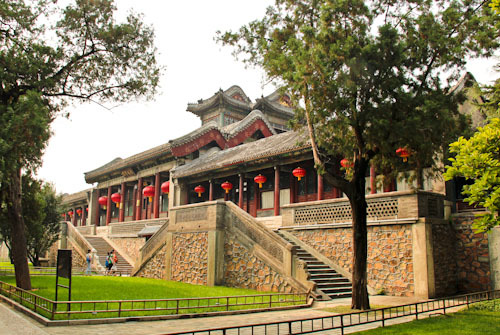 Although we only explored this fantastic parkland for a couple hours, with Linda’s guidance it was the perfect introduction to a whole lot of Chinese history and culture. I’m fascinated that this is not just a tourist attraction for foreigners — so many locals come here too. 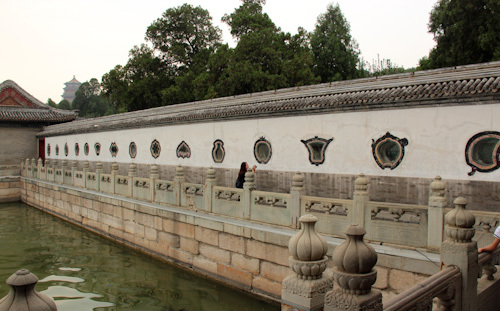 We’ve only skimmed the outskirts of the Summer Palace’s beauty, but I’m glad we were able to see what we have! What's for tea in HK? One of our favorite places when we lived there! Hi Lauren, please don’t misunderstand the intent of my question here… but I was wondering if you could give us some insights into how you finance these wonderful adventures. I am fascinated by this unique lifestyle you have chosen. I’ve been following your little blog here for a long time.